This granola was to be the crowning glory on top of one of my Vegan MoFo 2013 recipes, but the base – ice cream – failed. Not once, but twice. The third recipe, Peanut Butter Banana “Ice Cream,” worked like a champ, but didn’t call for the extra goodies on top. This granola stands on its own, so it seemed proper to share it. Try not to eat this all in one sitting! Thoroughly addictive, this crunchy pb maple pecan coconut bacon granola tastes sublime on your morning oatmeal or on top of non-dairy ice cream. Preheat the oven to 275-degrees F. Line a baking sheet with parchment paper. In a large bowl, stir together the oats, brown rice cereal, pecans, and coconut bacon. In a saucepan, melt the maple syrup, coconut oil, and peanut butter. Pour this mixture over the dry ingredients and stir well to thoroughly coat everything. Bake the granola for 10 minutes, stir, and return to the oven for an additional 10 minutes. Stir and return to the oven and bake for another 10 minutes. In my oven, it takes a total of 40 minutes to get the crispy consistency that I like – your oven may be different – so watch carefully that you don’t burn the granola. Remove from the oven, gently stir, and let cool. Oh my! I have all the ingredients and I just might make this later today with the children. Super!!! Thank you so much for letting me know; that makes my day. Ooh this looks so yummy! Peanut butter granola is my favorite. I eat it all the time and I’ve been dying to try some of that coconut bacon! This sounds rather delicious, I expect I would be nibbling on it as a sort of popcorn-like snack. It is VERY rather delicious. I have to ration myself. Yummo…. that looks like an awesome snack! My gosh Annie, this is so interesting! I adore the sweet and a little savoury combination so I bet I’ll love the bit of smoky ‘bacon’ flavour! Really need to make the coconut bacon, have been wanting to for so long!! The “bacon” adds just a nice little salty-smokiness that’s perfect w/ the peanut butter and maple. Definitely try the bacon – it is incredible. This sounds so good! 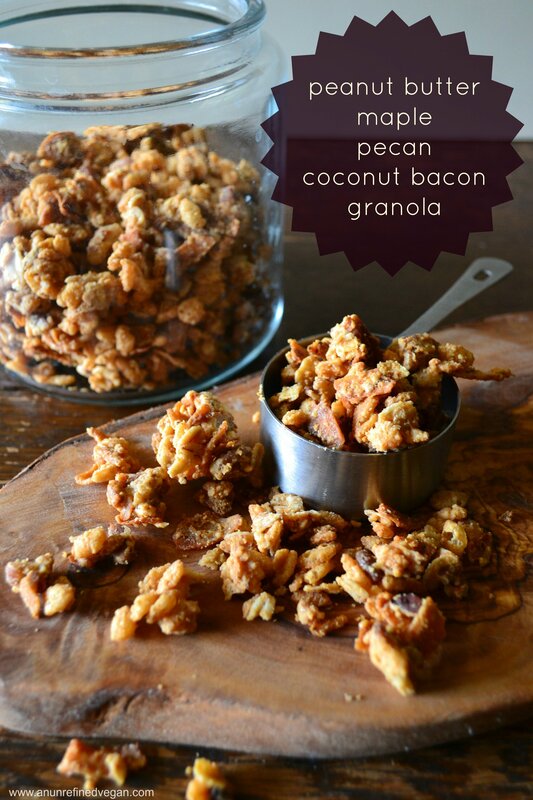 Coconut bacon is one of my favorite things, and I imagine it would be terrific in this salty/sweet combo. Too bad the ice cream didn’t work out. I’ve been loving coconut bacon on vanilla coconut milk ice cream. The really okay thing about the 2 ice creams not working out was that they were still edible ;-). I have never made a fancy granola. I NEED to change that. I can’t recall if I’ve ever even made ANY granola!! This looks wonderful. Crikey, girl!! Where have you been? You need homemade granola in your life! mmmmm sweet, salty…and PEANUT BUTTER!! Perfect! What’s brown rice cereal by the way? Like puffed rice? I know, right?! Yes – – brown rice cereal is puffed rice. I love the stuff. This keeps very well, Celeste. The last batch I made lasted about 2 weeks (hard to believe I had such restraint!). Ha! Yes! All it needs are some banana slices ;-)! This looks amazing. I love coconut bacon! Yum! I am so happy that the peanut butter recipes are still coming! Haven’t tried coconut bacon yet, looks like I will have to remedy that ASAP! Granola is the bomb. Whoa! I’m all for the sweet and salty combo and this sounds all kinds of good. It seems I need to go make more coconut bacon! Coconut bacon is wonderful – you’re going to love it!